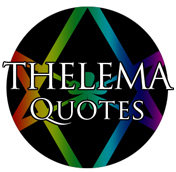 For the seventh installment of Thelema Quotes, the topic of whether Thelema is a religion or not is treated. As always, all quotations are from Aleister Crowley or The Book of the Law. “The world needs religion. Religion must represent Truth, and celebrate it. This truth is of two orders: one, concerning Nature external to Man; two, concerning Nature internal to Man. Existing religions, especially Christianity, are based on primitive ignorance of the facts, particularly of external Nature. Celebrations must conform to the custom and nature of the people. Christianity has destroyed the joyful celebrations, characterized by music, dancing, feasting, and making love; and has kept only the melancholy. “The many religions of the world have all lost their power to guide chiefly because the development of means of transport and of international commerce have convinced the educated that any one religion is about as good or bad as another for the purposes of social discipline, and that none has any validity from the standpoint of actual fact, or historical or philosophical truth. The remedy is evidently to be found only in one way. There must be found a formula based upon absolute common sense, without one trammel of theological theory or dogma, a formula to which no man of intelligence can refuse assent, and which at the same time affords an absolute sanction for all laws of conduct, social and political no less than individual, so that the right or wrong of any isolated or concerted action can be determined with mathematical accuracy by any trained observer, entirely irrespective of his personal idiosyncrasies. Feel free to leave your thoughts on these quotations and suggestions for future topics in the comments .